Connie added a new free cross stitch pattern this week Also, check out the new additions to the Etsy shop. Anyone who hand crafts gifts and decorations for holidays or other special occasions needs to plan ahead. Handcrafted things take time. Download Eileen's free spreadsheet. 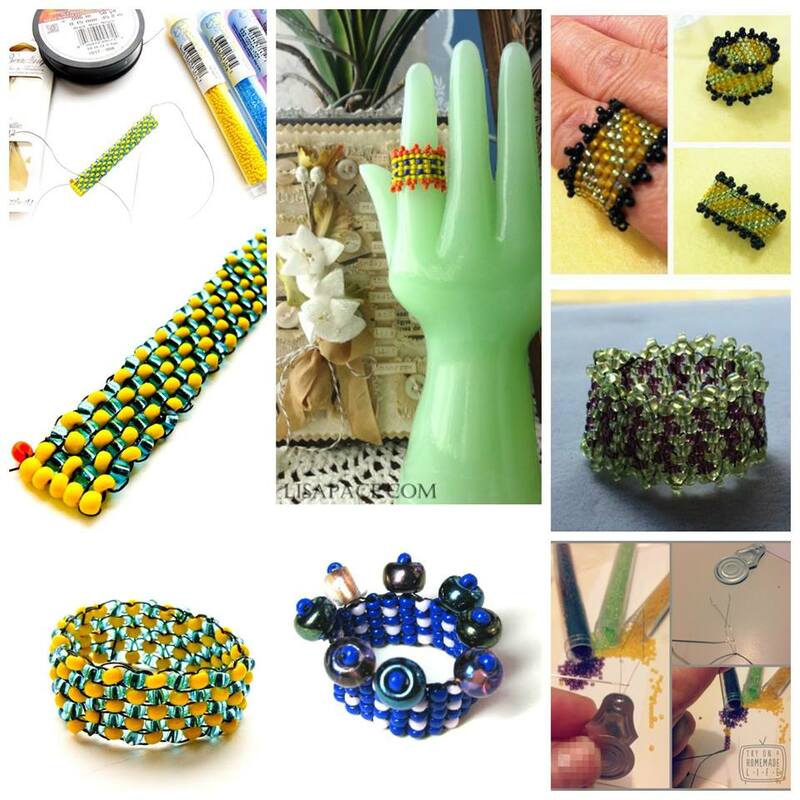 In the latest video podcast, the Crafty Princess shows off some finished knitting, crochet, and shares some bead weaving ideas. Sharing supplies with friends is always a thrill when you organize a blog hop. 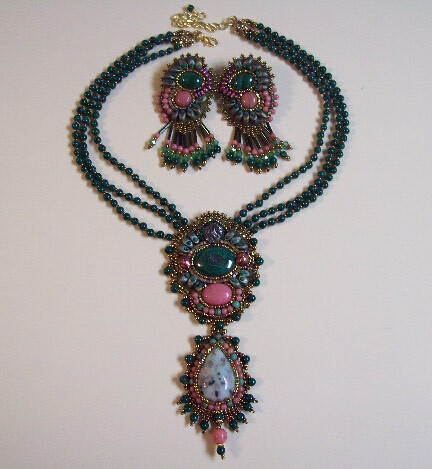 This one was excellent as it feature beaded rings. Love Peeps? Cherie has a new way to use them for your Easter table. 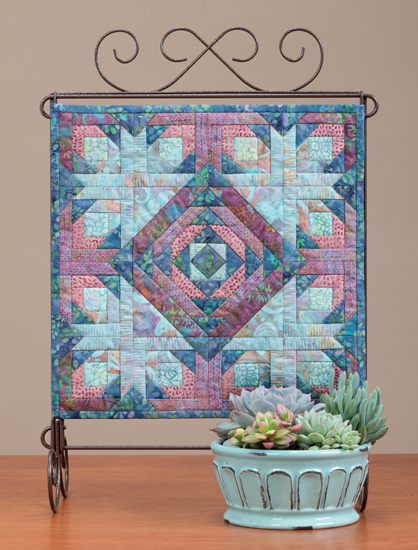 Erin Prais-Hintz hosts a creative challenge through Halcraft called, Pretty Palettes. This month, Andrew was the Pretty Palettes Partner! Stop by and see what he made! Check out what Ema has been up to in her Inside the Studio post this week, and be in with the chance to win a pair of her handmade metal matchsticks! My favorite bead store is Just Because Bead Boutique in Temple Tx. It starts when you walk through the door, you feel the creative and friendly atmosphere. The employees make you feel like you've come home to your jewelry making family and they are excited to see you. 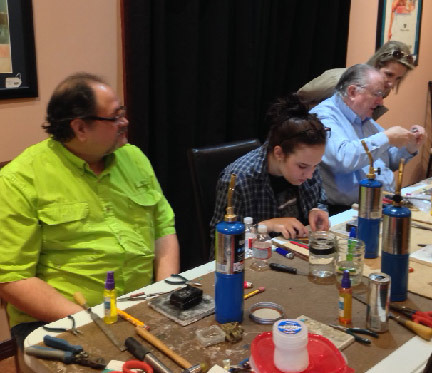 Most of their classes are free and you just pay for the supplies you need to create the project. There is always an instructor at the store in case you have questions or need help figuring out how to make something. If they don't have what you need they special order it for you and a few extra, because if you need it then someone else might also need it. It could be a special tool or special bead, it doesn't matter. They tell you it's a special place to leave the stress from the day outside and have time for yourself. If you want to spend the day there with friends making jewelry there is always an available space for you. 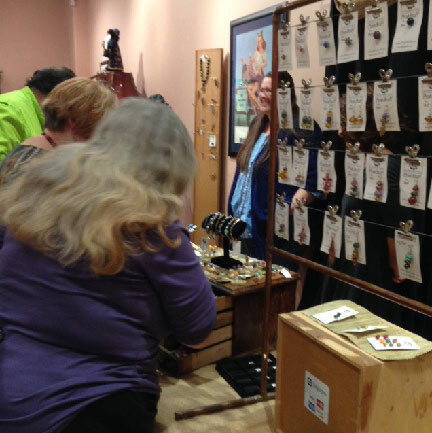 Special jewelry making groups meet there after hours like the America Needlework Guild and Rick's Loomatiks. This place is not like any other bead store I've ever been to and I love it. Here's the results from the hop that I told you about last week! 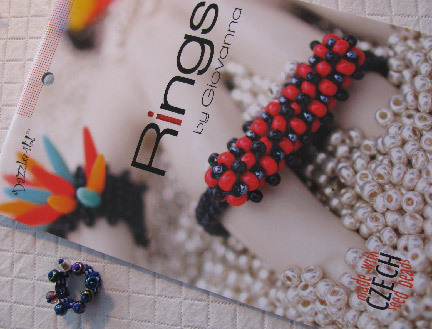 My friend Carmi Cimicata arranged it, bless her, and the rings that we all made were a lot of fun. 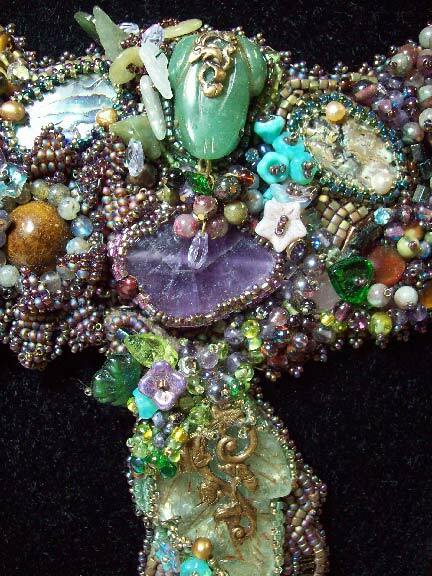 So now I've got my second piece for the 2015 Bead Journal Project finished, combining beaded crazy quilting with 3D forms. This month, my form is a simple crescent. 1. 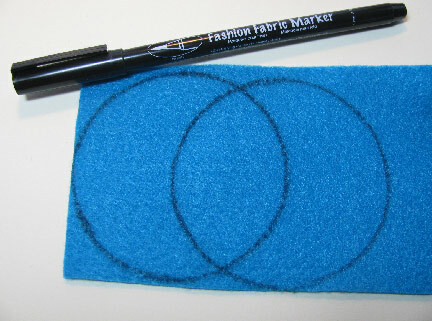 Draw two identical overlapped circles on some felt. 2. 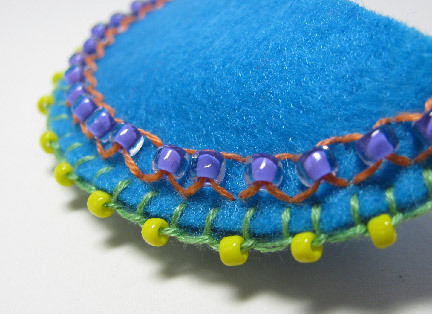 Cut the pieces apart, and cut a center piece out of a different color felt if desired. 3. Decorate the side pieces as you wish. 4. Stitch the curved edges of the side pieces together. I used embroidery floss with seed beads to do the blanket stitch. 5. Decorate the top piece. 6. 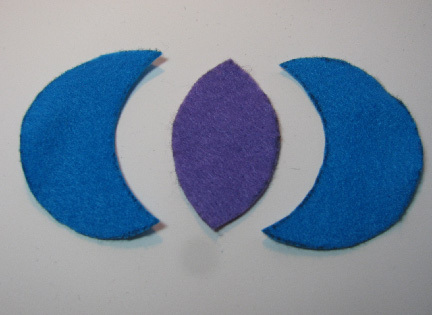 Stitch it into place, stuffing the crescent form lightly with batting. Most of the pieces have a kind of rustic style, but because these materials are now available in such a wide variety of bright colors (especially the paracord and ribbon), rustic doesn't have to mean just earth tones. The other things you will need are mostly glues and a few tools for simple wire work. From that point, all you really to do is dive in and try some of the easy-to-follow projects, with the step by step instructions Kalmbach is known for. 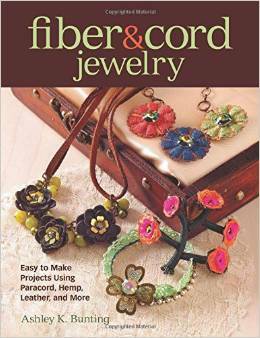 The jewelry in this book is not really my personal style, but I do think that the pieces are all interesting, wearable, and well-made. You'll have to decide if the style suits you or not! I love making quick little pendants from special beads. 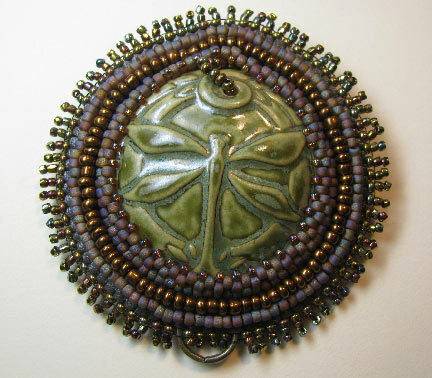 When I've got a wonderful bead, cabochon, pendant, or charm that I don't want to overwhelm with beadwork, my go-to technique is a peyote bezel and some back stitched accents, in colors that set off or blend with the focal rather than contrasting too much. Boring? Not at all when you've got focals this special! 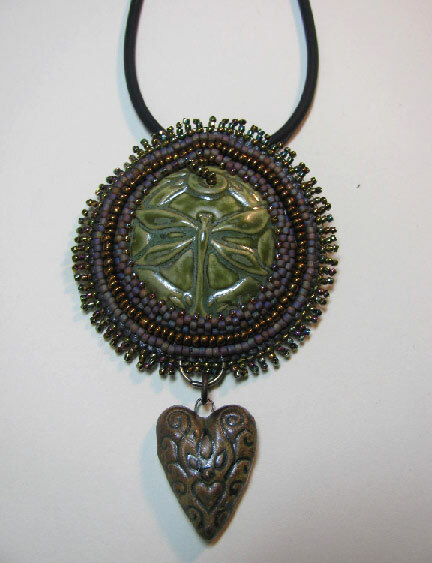 The dragonfly and the heart were made by Melanie Brooks of Earthenwood Studio. 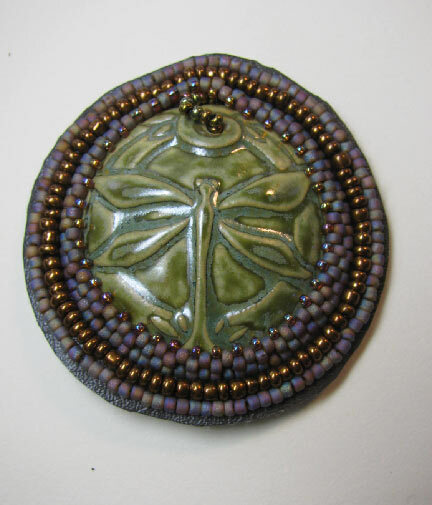 The stitches and techniques used in this pendant can be found in the free chapter of Every Bead Has a Story. 1. 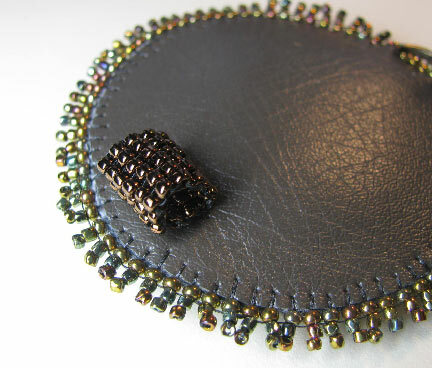 Stitch a peyote bezel around your cabochon using size 11/0 seed beads and ending with size 15/0s to cinch in the bezel top. 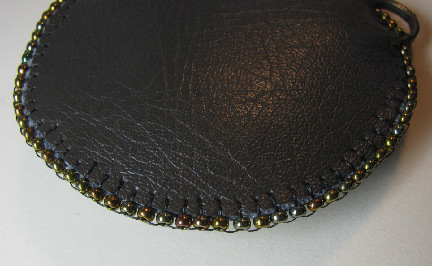 Add a couple rows of backstitch around the bezel and cut the foundation fabric, leaving a little edge. 2. Cut a matching piece of backing fabric and use edging brick stitch to attach the fabrics, trapping a ring at the bottom. 3. This is what the back looks like. 4. 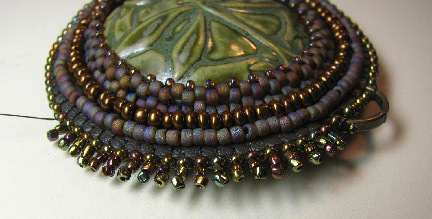 Add short stacks of size 15/0 beads to each edging bead. 6. 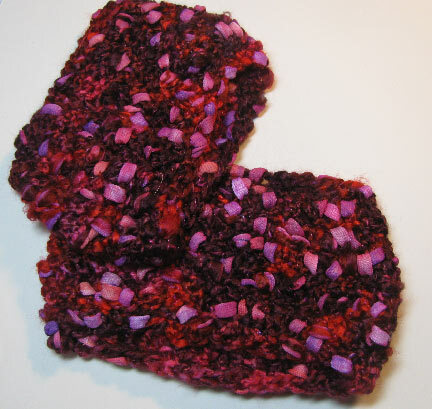 Add a square stitch bail to the top back. 7. Use a jump ring to hang a heart charm from the bottom. 8. The finished pendant, hanging on a black rubber necklace. Knitting a baby kimono brings with it a whole new crafting language. EnviroTex Lite Pour-On: The Possibilities! Looking at an entrancing butterfly-filled window pane created with Envirotex Lite Pour-On made Eileen consider using it for table top decoupage. The unique art created by 25 different artists working in the same tiny bezel is a joy to behold. 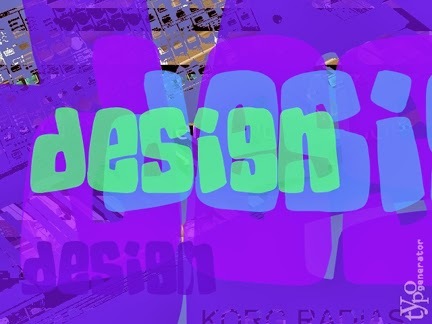 Come see the inspiring designs people created for the Desert Sands Challenge! 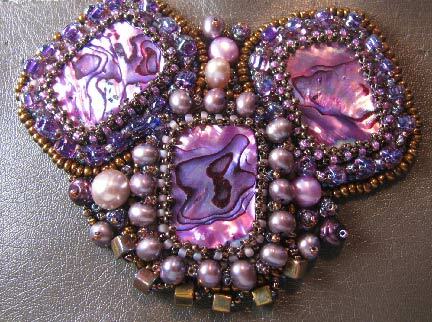 Many of you are probably like me and enjoy quilting as well as beading. 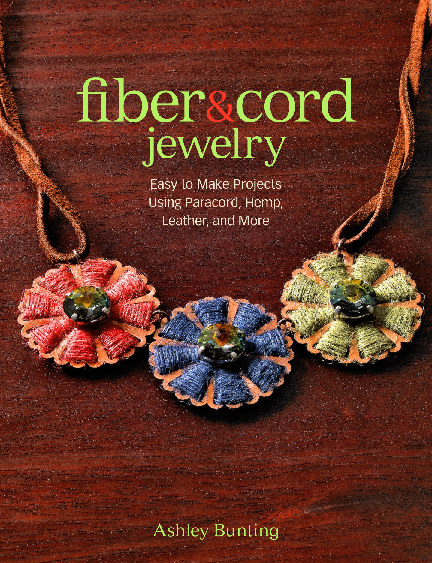 In fact, I'm sure all of the quilters out there already know about how much fun it is to combining beading with your quilts, but for those who haven't tried it yet, I've chosen one of the newest Martingale books to share with you that I think would lend itself well to the addition of beads. 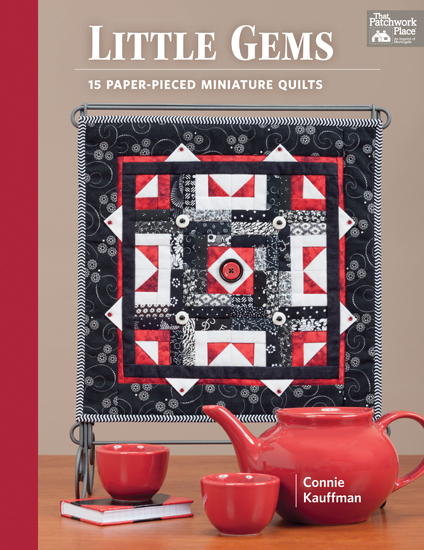 The finished quilts in this project book are only 12 x 12, so you can make them entirely from scraps if you'd like. Even the backing fabrics (14 x 14) could be pieced together from scraps. Little Gems is a great way to learn paper-piecing, if you've ever wanted to try it. There are scale patterns for you to use as you're learning. 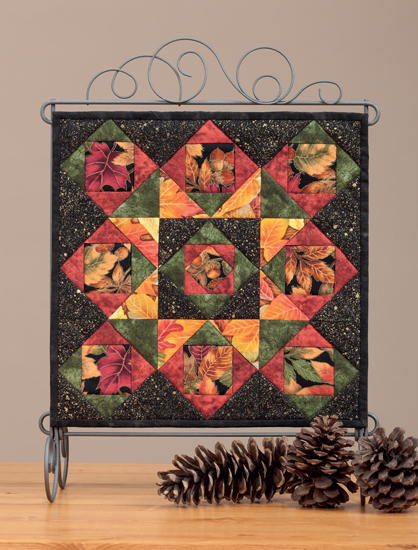 It also covers quilting, binding, and creating a hanging sleeve. The small size of these quilts would make them an excellent short-term project for adding beads if you've never combined the two before. I especially like the designs for "Forest Fire" (above), and "Tranquility" (below). Sharing sources: How do you ask? I had some small quantities of yarn left over from some other projects, and decided to figure out how to make some super-simple boot toppers with them. I wear them tucked into the tops of my boots to keep the cold air out. I love them with leggings the best, since they keep that little band of uncovered skin warm! Wouldn't these be great with beads? I didn't think of it until after I'd made them, and my suggestions, should you chose to heed my warning, is to only add beads to the top few rows! Using a medium sized crochet hook (size H), I chained 40, did 40 single crochet, and joined the ring. 4 rounds of half-double crochet. 1 round of single crochet, reducing one stitch every 5th stitch. 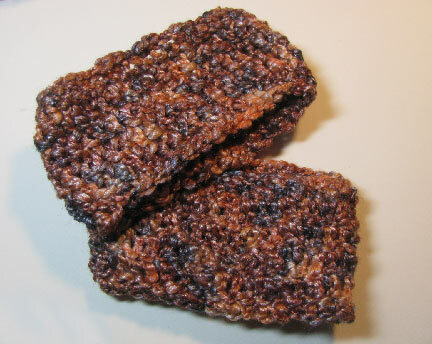 Attach the yarn to the other edge and single crochet around, reducing one stitch every 5th stitch. Cherie starts a series of paintings with brides. Eileen has gathered up her favorite handmade Valentine crafts, which have been created and published on The Artful Crafter over the past ten years. Take a peek inside the Tesori Trovati Studio with Erin, and see where her fallow season has been leading her...into the world of mixed-media art! 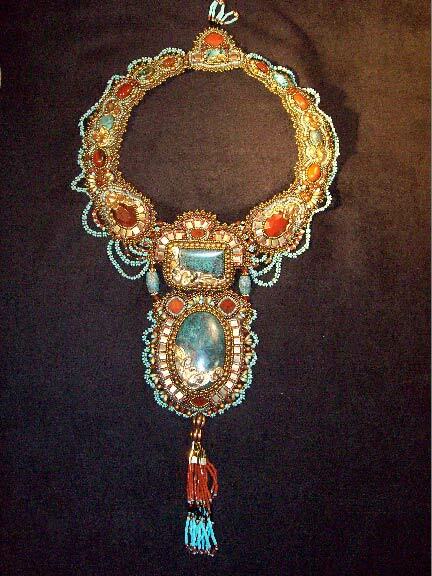 The neck-pieces shown in this post are a few of my favorites. 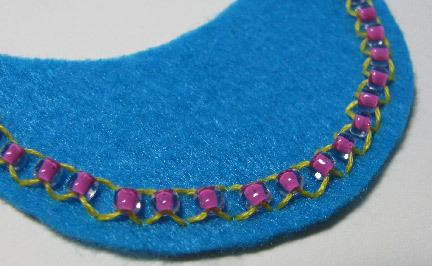 My technique is mostly back-stitch on my bead embroidery. 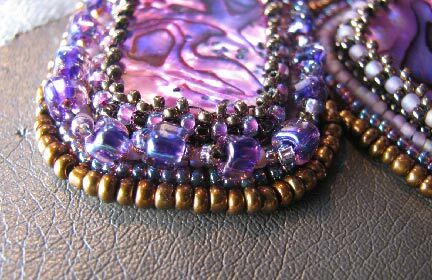 Although I enjoy all types of bead work, embroidery is my first love. 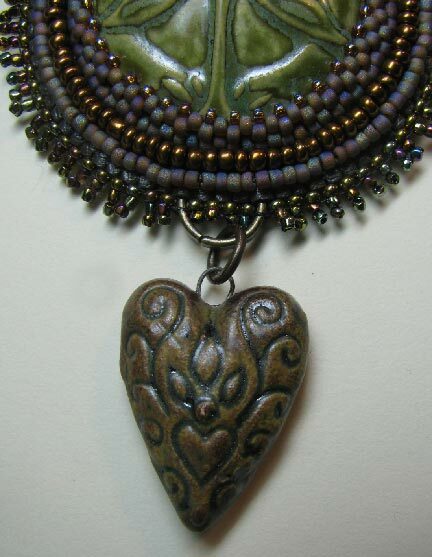 In the past 7 years I have come back to jewelry making after many years as a quilting teacher and sewing instructor. I had a successful bridal & evening wear business in Chicago, specializing in pieces that were heavily beaded and embroidered. 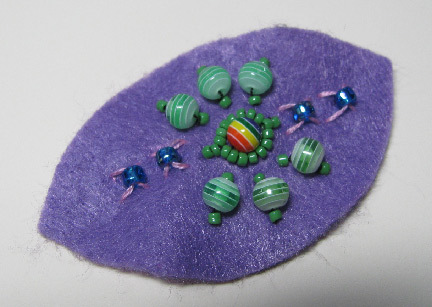 I am a team member of EBEG, etsy bead embroidery guild. You can see my pieces on facebook, twitter & pintrest and in my etsy shop (linked above). 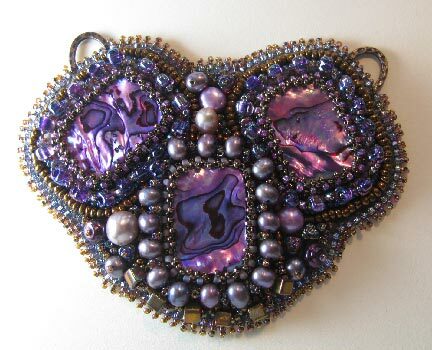 My pieces can also be seen in two bead magazine challenges: Bead & Button Aug. 2014 and Beadwork Dec/Jan 2014. 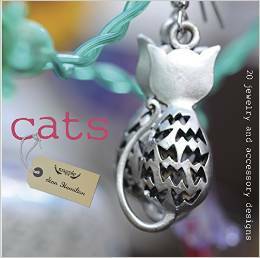 They have also been featured in ads for Fire Mountain Gems, bead catalogs, the back cover of Rock & Gem Nov. 2012, back cover of Bead-it magazine Dec.2013, back cover of the Crafts Report Feb. 2013 and at Fire Mountain Gems. 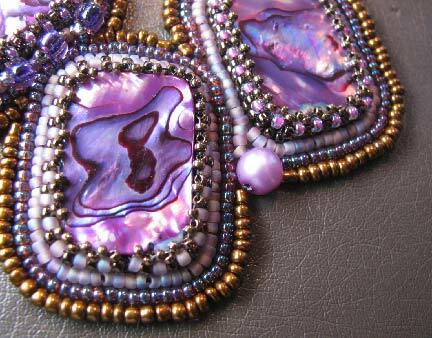 Most of my inspiration comes from nature and in many cases, the gemstones I am working with. I face the daily challenges of MS. I am completely devoted to my craft these days. My husband of 35 years helps with his encouragement, his photography skills and creative input. To be completely honest, I have never been that interested in all these shaped beads with two holes. 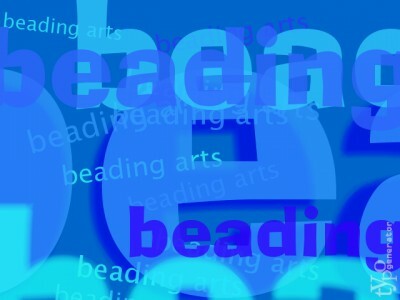 I love my seed beads and bead embroidery most of all, and bead weaving takes a distant second place in my affections. 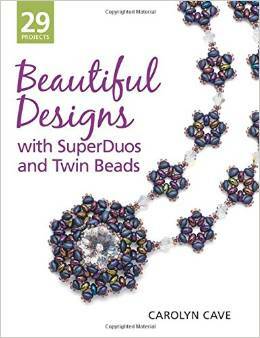 Looking at some of the beautiful patterns that Carolyn Cave has come up with for her new book Beautiful Designs with SuperDuos and Twin Beads, however, I may have to revise that opinion. In fact, there is one very simple design in the book that I almost can't wait to try. 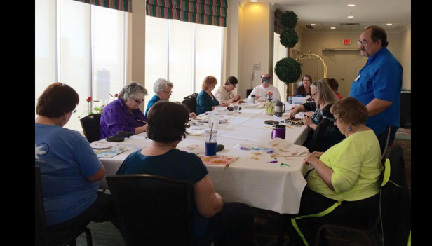 After a thorough introduction to twin beads and superduos, including information on basic techniques for stitching with them, Carolyn turns right to the projects. 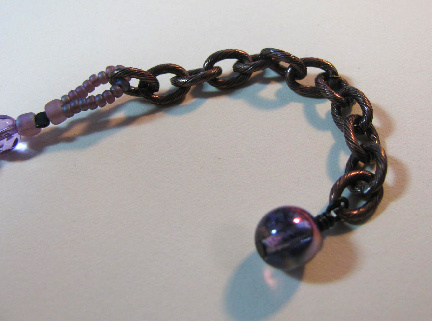 These are divided into five chapters: bracelets, rings and earrings, ropes, chains and pendants, and specialty pieces. 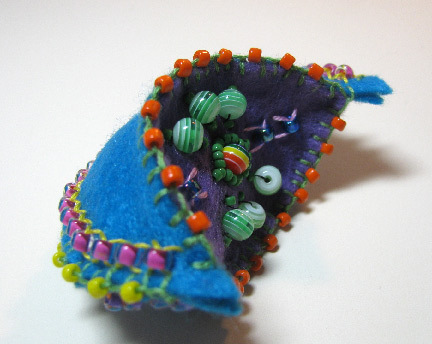 As I browsed through the projects, it struck me that many of the motifs that Carolyn creates can be used in many different ways, not only in the projects that she shares. 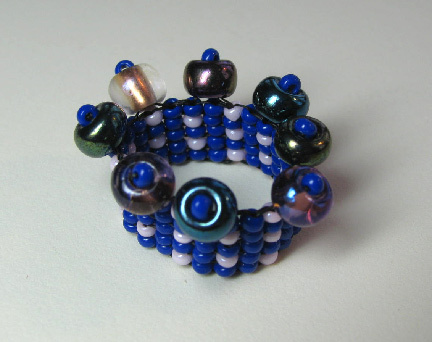 That makes this book very valuable to those who want to learn the basics of working with double-holed beads and who also like to experiment. 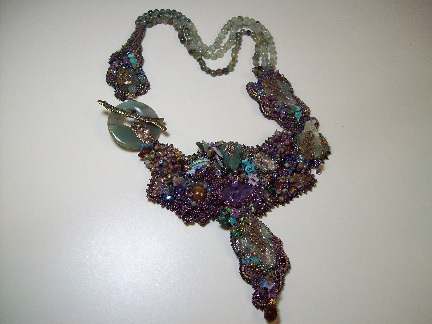 Most of the information you would need to create a piece like this can be found in the free chapter of my first e-book, Every Bead Has a Story, which has instructions for most of the stitches except for those linked individually below. 1. The focal paua shell pieces are drilled, so I did stitch them down before bezeling them with peyote stitch and outlining them with some back stitch. If they weren't drilled, it would still be really easy to bezel them into place, switching to tiny little size 15/0 seed beads at the top to cinch in the bezel. 2. I added some embellishments, stitching into the back stitched rows, using the bead embroidery form of Russian Spiral stitch. 3. Stack stitch fills in the gaps. 4. 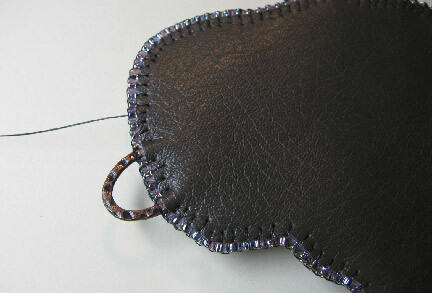 I used edging brick stitch around the outsides to attach a backing fabric and to trap two hammered loops. 5. 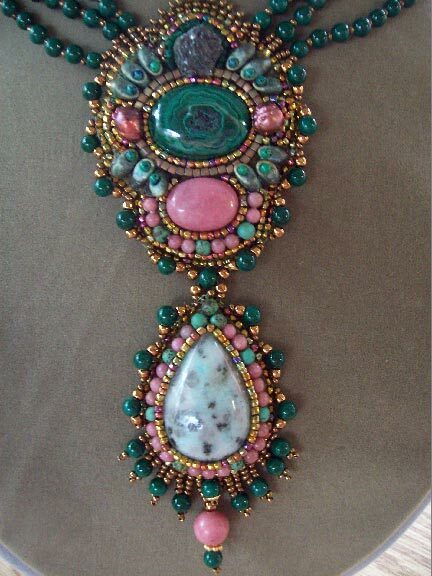 The finished pendant portion of the necklace. I added stack stitches around the edges. 6. 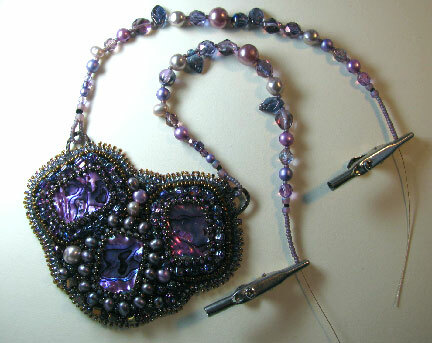 Beading wire neck straps with coordinating accent beads. 8. 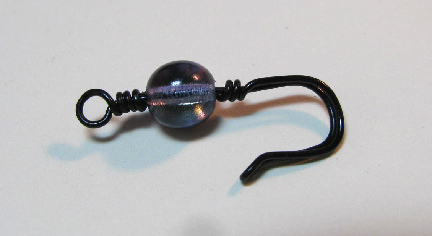 ...and a handmade hook on the other. 9. 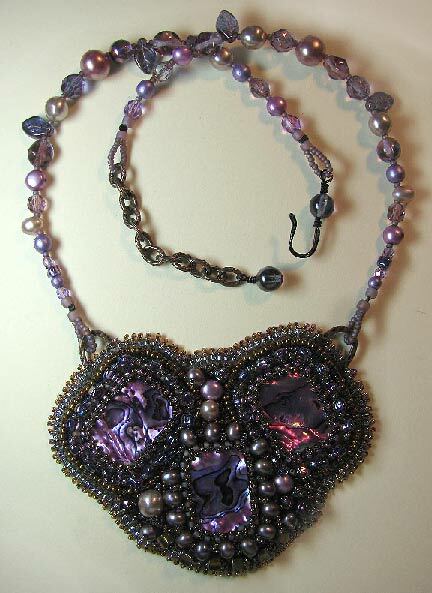 The finished necklace with an adjustable closure.